Pictured front row, L to R: Maria Rindenello-Parker, Nancy O’Brien, David Kolacny, Jason Azem, Andrea Ventura, Davide Rosso, Peter Wiley, Rachel Galbraith, Hilmar Gusik; middle row: Juno Lin, John Papadolias, Maro Lejarre, Shoichiro Takiguchi, Ryan Skelly, Davide Arduino, Billy Hornby, Stephen Hartman; back row: Antoni Gralak, William Yaros, Karen Gottlieb, Rocco D’Andretta, Dieter De Wilde, Karen Rokos, Steve Moss, Marco Bertola. Not pictured: Colin Campbell, Ed Galchick, Ivan Gardner, Bastien Golliard, Robert Hohlbach, Dan McGinley, Jennifer Ruggieri, Joseph Urban. 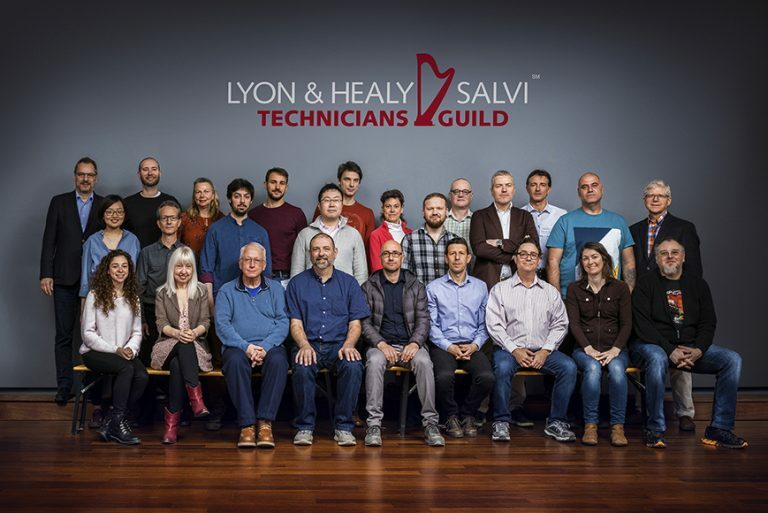 Salvi Harps hosted the sixth Meeting for Members of the Lyon & Healy/Salvi Technicians Guild in Piasco, Italy in late March, 2019, where members met for ongoing education, the exchange of ideas and to meet with management from both brands. “The ongoing maintenance of our instruments is vital to harpists’ sound and overall satisfaction with their harp,” said Enzo Vizzone, CEO of Salvi Harps. “We place great importance on providing continuing education to the technicians and also collecting their firsthand knowledge from working with our customers every day.” The technicians met at the Salvi Harps factory in Piasco, Italy, for hands-on workshops on a variety of harp technology topics to further develop their skills in maintenance, repair and regulation. The first meeting was hosted by Lyon & Healy in 2006, and subsequent meetings have been held at Salvi Harps in Italy and Bow Brand in England. Lyon & Healy Harps and Salvi Harps are proud of the skilled craftsmanship that goes into building each one of their harps and established the guild to identify those technicians that meet the standard required to maintain the level of expertise. A harp is a complex instrument, affected by its environment and amount of use, and Guild members have the skill set necessary to consider these factors during service. Beside establishing a standard, the Lyon & Healy/Salvi Technicians Guild also makes it easy for harpists to identify which technicians are trained and authorized to work on their instruments. The Guild’s newly designed website, www.harptechguild.com, allows visitors to narrow their search geographically and use a simple form to contact all members that service their region simultaneously.